In 1931 Pablo Picasso illustrates Ovid’s Metamorphoses in 30 etchings. The exceptional edition, limited to 145 copies, is the first publication by the newly founded Skira. It was soon followed by Mallarmé’s Poems with 29 original etchings by Henri Matisse and Les Chants de Maldoror illustrated by Salvador Dalí with 42 engravings. These extraordinary limited-edition artist books gave birth to the legendary Skira logo, and today, the publishing house simply had to return to its roots, joining the savoir faire of its impressive publishing tradition with the exceptional potentials of current technology. The new Limited Editions by Skira are divided into two series: the Collector Editions, which will include an original numbered edition signed by the artist and the Fac-Simile Editions, which will offer, in perfect, philological reproduction, some cornerstones of Art publishing of all time. In both cases, the editions are limited and numbered, elegant and unique, conceived and created with the upmost attention to detail, from the texts to the images, from the binding to the packaging. Intended for bibliophiles and collectors searching for the magic of a precious and extraordinary book destined over time to grow in value. 3 books in large-format, enriched by three numbered silkscreens authenticated by the Archivio Guido Crepax and an artistic plate designed by Lorenzo Mattotti. Each piece is a unique item. Each copy includes an authentic numbered print signed by the photographer. The Gold Card is born, Skira’s most exclusive card. The Gold Card offers a customised service dedicated to an elite of top customers, close to the publishing house and accustomed to always expecting the best. 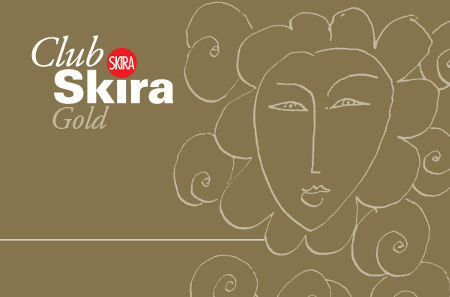 The Gold Card is not available upon request, but rather Skira will offer it to its most attentive followers. Those who purchase a work from the new line of editions de luxe, called the “Limited Editions”, will receive their own personal card, with a specially designed packaging. The Card can satisfy the most demanding needs and allows members to benefit, within the world of art, publishing, exhibitions and events, from truly exclusive privileges that have never been offered before. Personal invitations to the openings of the exhibitions produced by Skira Group. Invitations to the exclusive events organised by Skira and MondoMostre Skira. Personal invitations to the presentations of special editions. Special conditions reserved for the purchase of works of art. Special discounts on the advance order of particular volumes. A discount code of 50,00 Euro to spend on skira.net on the occasion of your birthday, which is valid for one week. Special conditions reserved for the purchase of volumes from Bocca, the most historical Milanese bookstore situated in the heart of the city. A call-center exclusively reserved for Gold Members, active each working day, available to provide information and privileged access to museums and exhibitions managed by Skira. An email address, reached at limitededition@skira.net available to provide information. and will not be tacitly renewed. Upon presentation of a valid Skira Gold Club Card, members will enjoy VIP Welcome and special advantages at Mandarin Bar & Bistrot and The Spa at Mandarin Oriental, Milan. Terms & Conditions apply. Skira Club members are entitled to special discounts (up to 70%) on performances. Learn more about promotions by visiting the theatre website! Skira Club members have discounted admission to the Vigna di Leonardo in the Casa degli Atellani. 20% discount on FAI heritage admission, open to the general public (discount not applicable on exhibitions or events), upon presenting the Skira Club red card. Discounted ticket on Exhibitoons and Show events. Discounted ticket on entrance tickets for Shows at the Litta Theatre, Sala Cavallerizza and Leonardo theatre.